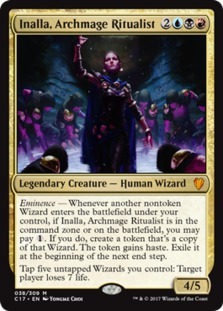 One of the new Eminence commanders, Inalla has an ability that affects the battlefield even if she’s in the command zone. Like Edgar, she triggers when her tribe mates hit the battlefield, but unlike Edgar you have to pay a colorless mana to make a token, and the token is exiled at the end of turn. Her secondary ability is not exactly ideal, but is serviceable if you absolutely need to do some direct damage to a player — tapping down 5 wizards isn’t great though, and there are other reasons in the deck that you may want to tap them. Like Kumena, the ability to tap your tribe mates is nice, I just wish the effect was something else. Anyway, there were two new additions from Dominaria that prompted me to make this deck, and I’ll show you why. Naban here is basically a Panharmonicon on legs, but only triggers when wizards enter the battlefield. Inalla also wants wizards in her deck, so this is a tribal theme, but I want to exploit the “enters the battlefield” triggers as much as possible. Let’s say Inalla is in the command zone and I cast a wizard with an ETB effect like Naru Meha. Naru Meha is one of those flash (can be played like an instant) creatures that has a nice ability on her, so if I cast a spell like demonic tutor, then flash in Naru I can copy that tutor effect and get out another card ( She has the added benefit of being a wizard lord, granting +1/+1 to other wizards). Now if I pay the additional mana, I’ll also get a token of her that will allow an additional card to be tutored, and if Naban is on the battlefield we’ll get another. Ditto this if Panharmonicon is out. You can literally trigger multiple times under the right circumstances and the major benefit is that you don’t have to have your commander on the battlefield to abuse this ability. Most decks that center around their commander want to cast it as soon as possible to get their game plan rolling — with Inalla you won’t have that problem. This is the main crux of the deck, but let’s take a look at some of the awesome wizards I’ve included that we can exploit. Most of the creatures in the deck are wizards, so they can be tapped with cards like Azami, Galecaster Colossus or Patron Wizard. First we’ll exploit Inalla’s eminence effect and whatever triggers may happen when they enter the battlefield, and then draw cards, bounce permanents or counter spells. Some wizards will draw me cards off of their ETB, others will do damage, and others have various control effects. Two non-wizard creatures I’ve highlighted here are the Docent of Perfection and Deadeye Navigator. Both should be self-explanatory inclusions, but the Docent is another wizard lord of sorts in that it makes me tokens when I cast spells, but then flips once I control 3 wizards (which could happen the turn it’s played) and then gives wizards a pump along with flying. The Navigator is included because of his blink effect when he is soulbonded, which can further exploit ETBs and utilize Eminence. The spell package is a standard one, including some tutors (Mystical and Gamble), counters (including the new Wizard’s Retort which is either a Cancel or a Counterspell depending on if you have a wizard on the board), and card draw (Dark Bargain, Ponder, etc). Various forms of removal are available in Grixis, so I’ve touched on all of those strengths. Deep Freeze is another Imprisoned in the Moon, good for removing a large threat or a dangerous commander. Flameshadow Conjuring also goes along with our them of making additional copies of creatures for a low mana cost, though they will also leave the game at the end of turn. There is a trick to keep this from happening though! Sundial of the Infinite requires a one mana investment but can be used at any time. It will end the turn whenever you like during your turn, and if we want to keep additional tokens that are being created by Inalla or Flameshadow Conjuring, we’ll want to use this trick before our end step. This card will end the turn so that the exiling at end of turn clause on those cards will be voided. It also keeps you from your cleanup step, so if you don’t have a way to increase your maximum hand size and draw a bunch of cards, you don’t have to discard either! One way to draw a bunch of cards outside of using Azami is to utilize Mind over Matter with creatures like Arcanis The Omnipotent, tapping him to draw 3 cards and then discarding a card to untap him and repeat the process. You can literally draw your entire deck with this combo, and a well timed Laboratory Maniac can win you the game. This isn’t necessarily the most competitive version of this deck and I haven’t finished building it just yet so testing won’t happen for a while. Inalla is listed as a tier 2 general and I see the potential to exploit her. I’ll report back once I’ve done some playtesting, but I’m sure this deck will run just fine. You can see the full decklist here.